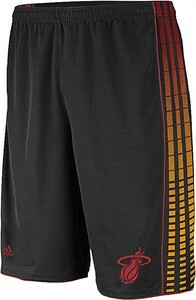 Letting you play in comfort with its 11 inch inseam the Miami Heat Vibe Shorts by Adidas comes in Black and is an Officially Licensed NBA Product. These NBA Shorts are great for the gym or playground because they give you plenty of room to move with their athletic-fit body and keep you comfortable with 100% Poly Performance material that helps wick moisture from your body. Features include a lightweight body, tonal Adidas 3-Stripes down both legs, color contrasting piping on both legs, an elastic waistband with an internal drawcord, and embroidery on the right hem Adidas logo and on the left hem Heat graphic.